Congratulations to the winner of this round’s Featured Bio Contest Lael Rosek and this round’s Feature Nominee Ayiana Sevo! Lael was born two minutes before her twin brother Kellan on Stardate 236610.24 to Adelynn Rosek in Cedar Springs, Michigan. She never met her father and, due to her mother’s silence, knew very little about him. From a young age, Lael showed a talent for Mathematics and her curious nature led her to a passion for taking things apart to see how they worked. Though she was bullied in her younger years due to her Al-Leyan heritage, her easy-going and compassionate nature won her many friends. As she grew older, she sought more adventurous pursuits, chief among them being sailing, cliff-diving, water skiing, rock climbing, and swimming in local ponds and lakes. Lael Rosek currently serves on the USS Veritas as an Engineering Officer and has made her her way up the ranks to full Lieutenant. 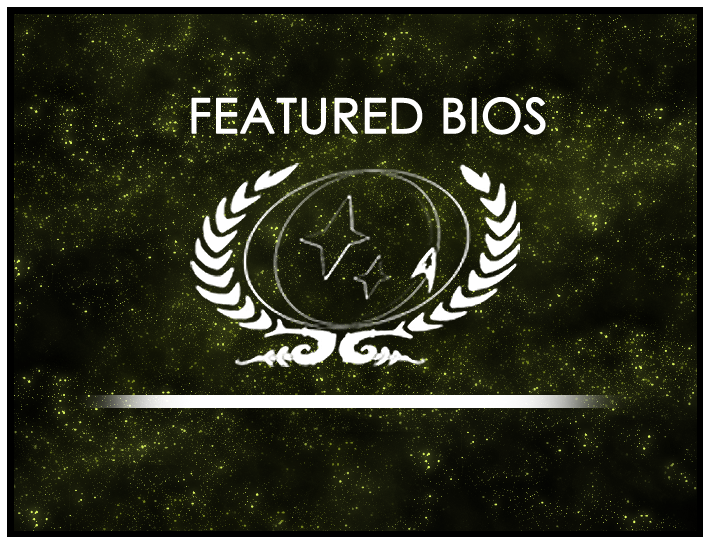 The current round of nominations for the Featured Bio Contest closes September. 1st, 2017 so head over to the forums and nominate someone today! You can find out more about the Featured Bio Contest at its wiki page or in the forums.